Also I was wondering what is your favorite bait to use? Are there some things that are a no no in the ring for bait? Like overly smelly treats or anything? What are your must haves for shows? I am trying to make a list I can print off and maybe laminate and check off before each show so I don't forget anything. My handler uses chicken breast for bait. She generally buys a bag of frozen (unbreaded) chicken strips, and thaws that out. Scarlet loves it! The only thing you need to be aware of is dropping bait on the ground. PICK IT UP! I make a check list before each show. If it’s an out of town show, then I have a LONG list. If it’s a local show, I don’t need to drag as much stuff with me. 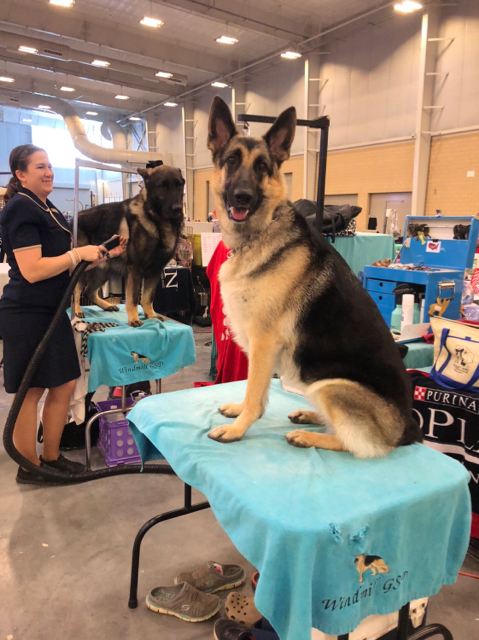 We groom at the show too, so there’s all that equipment. At the grooming site I have a crate, clip on bucket for water, and a crate pad. Usually a sheet to throw over the crate to keep the dog quiet. Grooming involves a grooming table with an arm and noose. Blow dryer, extension cord. Shampoo, if you haven’t bathed your dog the night before. Whatever products you need (bodifier, etc). A comb. Towel. If you spend the night, then you need to bring food, bowls etc. I found some random photos of our grooming setups. Sabis mom and Datura like this. Of course you’ll probably need bandaids, ibuprofen, and general first aid stuff for yourself, because invariably you’ll need it, lol. Oh and POOP BAGS!! keep one in your pocket. angelas and Datura like this. I've heard a few people throw a sheet over the crate. Does it work with super nosy dogs, or do they just get upset they can't see anything? Dean is a nosy and vocal fella, and I would hate to ham him throw a temper-tantrum and bother people. Does that bother people? The chicken she uses is already cooked, so it’s pretty easy. 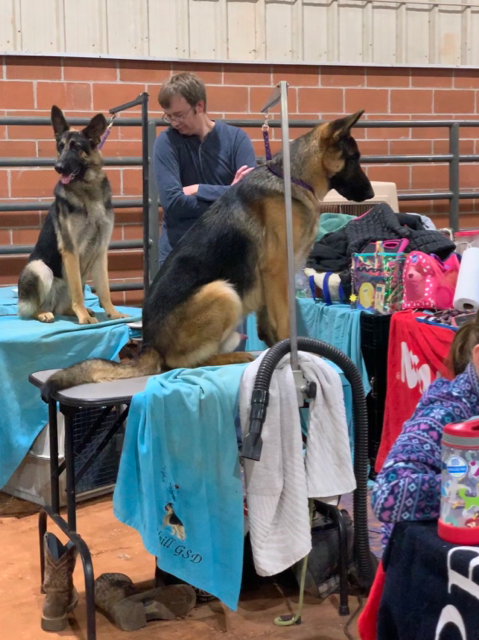 As far as covering the crate with a sheet, well, a lot of GSDs will bark at dogs walking by the crate. Barrier frustration, I guess. So that sheet comes in handy! Just wanted to say good luck and have fun!! As an aside, for those that think American show line sables are always light colored, take a look at that big ol’ dark sable in the background of the first photo.